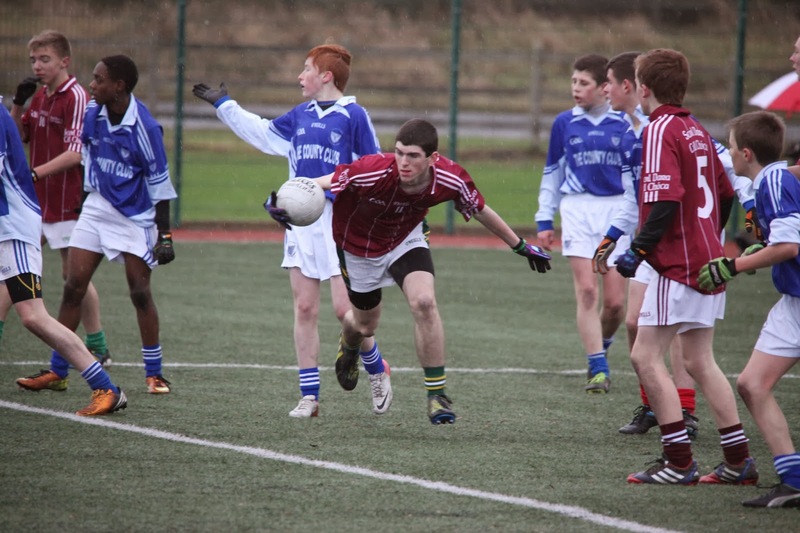 Scoil Dara’s Conor Frayne helps out his defence near the end of the game. A man of the match performance from Summerhill’s Conor Frayne inspired Scoil Dara, Kilcock to victory over Dunshaughlin Community College in the North Leinster Juvenile B colleges final played on the all-weather pitch in Dunganny, Co.Meath on Thursday 19th December. The game, which was a repeat of last years’ decider, was played in Artic like conditions, as a strong, icy breeze blew across Dunganny. The Meath side were the victors in that showpiece in 2012 but Scoil Dara were not to be denied on this occasion as they made it ‘third time lucky’ (having lost their last two finals) and in doing so gaining some revenge for last years’ reversal. Despite playing into that harsh winter wind in the opening half, Scoil Dara started the brighter and opened the scoring through that man Frayne after only two minutes, when he split the posts to point with his trusted left foot. Dunshaughlin did enjoy a brief spell in the lead after that thanks to Blackhall Gaels’ Rian Kealy who pointed on three minutes and blasted the ball to the back of the Scoil Dara net four minutes later following some good work from Paddy Maher. That lead was short-lived however, as Scoil Dara launched an attack straight from the kick out and following some fine running from their impressive wing forward Leo Loughnane, who cut a hole in the Dunshaughlin defence, Frayne finished the ball to the back of the net to level things up. Scoil Dara kicked on from here and began to pick off some excellent scores including points from Loughnane and Frayne, with captain Daniel Devine’s well taken individual goal sandwiched in between the two on thirteen minutes. The sides exchanged points through their respective full forwards, Paddy Maher pointing a free for Dunshaughlin to stem the tide and Jack McNally for Scoil Dara after some hard work from Frayne. The game looked to be over as a contest on 22 minutes after Scoil Dara corner forward Eoghan Mulhall made it 3-4 to 1-2, with as good a team goal as you will see all year. Adam O’Connell, Loughnane and Paddy O’Sullivan were all involved in the build up with the latter supplying the final killer pass to Mulhall, who duly blasted the ball to roof of the Dunshaughlin net, giving goalie Aaron Lawlor no chance. The south Meath side were not about to give up too easily though and in typical Royal county fashion, they staged a mini revival with two goals in two minutes to stun Scoil Dara. Conor Oliver created a chance for Paddy Maher, who calmly slotted the ball past Fionn Talbot for the first. A long floating ball in from midfield from Eoin Harkin broke to the dangerous Conor Oliver who side footed the ball home for the second to leave only two points between the sides. Jack McNally (Scoil Dara) and Matthew Moyles (Dunshaughlin) exchanged points just before the break to once again leave two between the sides. Infact Dunshaughlin could have been ahead at the interval had it not of been for the heroics of Talbot in the Scoil Dara net. The Kilcock clubman pulled off a fine one on one save from Moyles right on the stroke of half time to leave the score board reading Scoil Dara, Kilcock 3-5 Dunshaughlin CC 3-3. Dunshaughlin until the 28th minute to register their only score of the half through wing back Josh Kallides following some excellent work by Mika Mibua. However it was nothing but a mere consolation. Facing the stiff breeze, their challenge faded almost as quickly as the daylight on what was an icy cold day at Dunganny. Right from the restart, Adam O’Connell slotted over a point for the eventual winners following some excellent individual play, to settle any nerves the men in maroon and white might have had. Two more points followed from McNally before Scoil Dara’s full-back Adam Murphy made a fantastic saving block to deny Dunshaughlin a certain goal-scoring opportunity. Though his forwards received most of the praise post match, Murphy’s block was definitely a game changing one. Frayne added his second goal soon after before points from McNally (2), Paddy O’Sullivan (2), Loughnane, Devine and Mulhall put the scoreline beyond doubt. Dunshaughlin did enjoy a period of sustained pressure in the closing stages but Kallides’ point was all they had to show for it as the Scoil Dara rearguard stood firm. 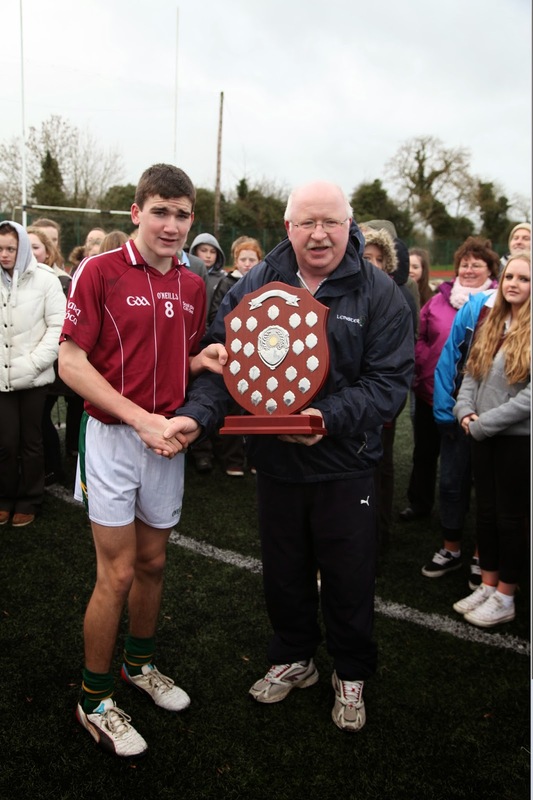 After the game Mick O’Keeffe presented the shield to Scoil Dara captain Daniel Devine. Scoil Dara, Kilcock – Fionn Talbot (Kilcock), James Kinehan (Kilcock), Adam Murphy (Jenkinstown Gaels), Dylan Bradley (Kilcock), Oran Smullen (Na Fianna), Ciaran Smyth (St.Kevins), Sean Rafferty (Na Fianna), Daniel Devine (Na Fianna 1-1), Shane Walsh (Na Fianna), Leo Loughnane (Kilcock 0-2), Conor Frayne (Summerhill 2-2), Adam O’Connell (Kilcock 0-1), Eoghan Mulhall (Kilcock 1-1), Jack McNally (Na Fianna 0-6, four frees), Paddy O’Sullivan (Kilcock 0-2). Subs – Josh Sherlock for Rafferty 53 mins, Bernard McInerney for Mulhall, Kian Hussey for O’Sullivan both 56 mins. Dunshaughlin CC – Aaron Lawlor, Ronan Hiney, Conor Keena, Paul Kennedy, Josh Kallides (0-1), Mika Mibua, Jarlath Jordan, Rian Kealy (1-1), Eoin Harkin, Matthew Moyles (0-1), Niall Hurley, Luke Thorpe, Conor Oliver (1-0), Paddy Maher (1-1), Wesley Goodwin. Subs – Colm Byrne for Thorpe 20m, Jack Caldwell for Hurley 50m.